For all those lovers of fruitcake who aren't keen on marzipan, here's the answer: a stylish honey-nut finish that can be assembled in minutes. 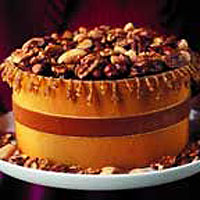 Toasted whole brazils, hazelnuts, almonds, walnuts and pecans are mixed with clear honey to make a nutty praline topping. Melt 1 tablespoon butter in a small pan. Add a 200g bag Waitrose Mixed Whole Nuts and fry for 1-2 minutes, or until the nuts are toasted and beginning to brown. Add 4 tablespoons Waitrose Orange Blossom Honey and cook for a further 2 minutes. Remove from the heat, allow to cool a little, then spoon over the top of the cake and arrange in an attractive pattern. Allow the topping to set, then secure a ribbon around the sides of the cake.